Stefani Joanne Angelina Germanotta was born March 28, 1986, and is known professionally as Lady Gaga. She is a singer, songwriter, actress, and LGBTQ activist. She is known for her unconventionality and provocative work as well as experimentation with new images. She is also an amazing performer. Below is her cover of the Elton John classic, "Your Song," which will be included in an upcoming tribute album, Revamp, set for release on April 6. 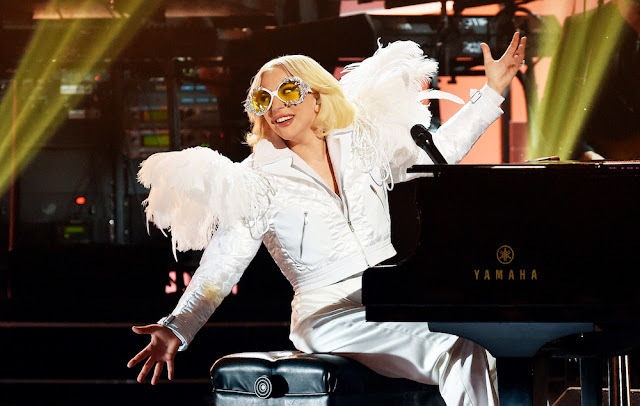 Gaga began her musical career performing songs at open mic nights and school plays. She studied at Collaborative Arts Project 21 (CAP21) through New York University's Tisch School of the Arts before dropping out to become a professional musician. Gaga worked as a songwriter for Sony/ATV Music Publishing, where Akon helped her sign a joint deal with Interscope Records and his own label KonLive Distribution in 2007. 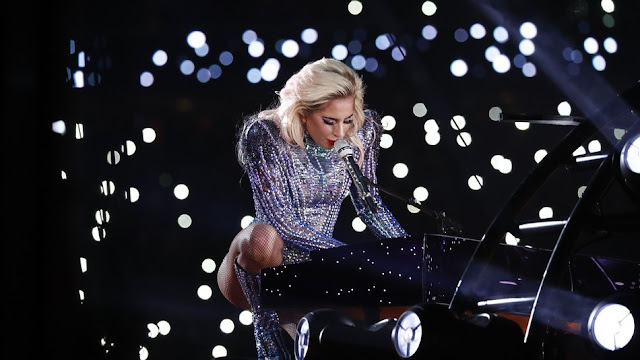 She rose to prominence the following year with her debut album, a dance-pop and electropop record titled The Fame, and its chart-topping singles "Just Dance" and "Poker Face." A follow-up EP, The Fame Monster (2009), featuring the singles "Bad Romance," "Telephone," and "Alejandro" also proved successful. Gaga's second full-length album Born This Way (2011) explored electronic rock and techno. The album topped the US Billboard 200 and sold more than a million copies in the country during its first week. Its title track also became the fastest selling song in the iTunes Store with over a million downloads in less than a week. Gaga ventured into R&B and disco with her third album Artpop (2013), which topped the US charts and included the single "Applause." In 2014, Gaga released a jazz album with Tony Bennett titled Cheek to Cheek, her third consecutive number one album in the US. For her acting work in the television series American Horror Story: Hotel (2015–2016), Gaga won a Golden Globe Award for Best Actress in 2016. Her fifth studio album, Joanne (2016), incorporated genres such as country and pop, and she became the first woman to have four US number one albums in the 2010s when it topped the country's charts. In February 2017, Gaga performed the Super Bowl LI halftime show, which was met with critical acclaim. Having sold 27 million albums and 146 million singles as of January 2016, Gaga is one of the best-selling music artists in history. Her achievements include several Guinness World Records, three Brit Awards, six Grammy Awards, and awards from the Songwriters Hall of Fame and the Council of Fashion Designers of America. Gaga has been declared Billboard's Artist of the Year and included among Forbes's power and earnings rankings. She was ranked at number four on VH1's Greatest Women in Music in 2012, finished second on Time's 2011 readers' poll of the most influential people of the past 10 years, and was named Billboard's Woman of the Year in 2015. 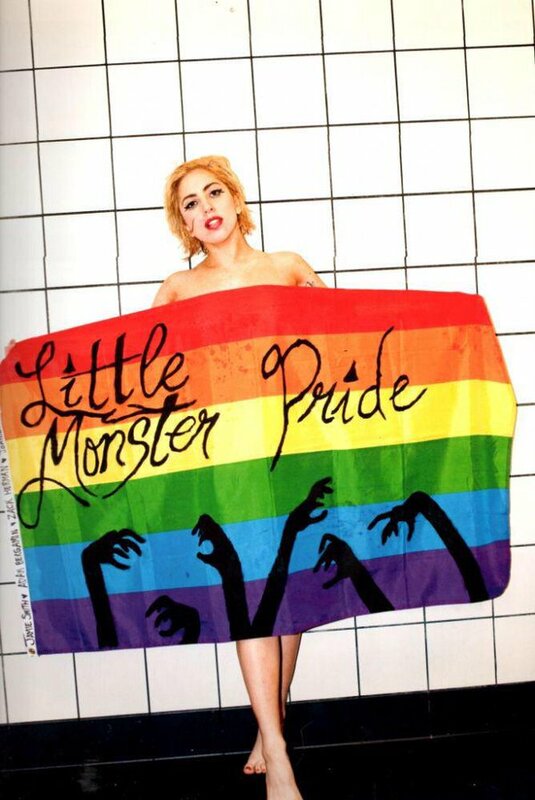 As a bisexual woman, Gaga actively supports LGBT rights worldwide. She attributes much of her early success as a mainstream artist to her gay fans and is considered a gay icon. Early in her career she had difficulty getting radio airplay, and stated, "The turning point for me was the gay community." Gaga spoke at the 2009 National Equality March in Washington in support of the LGBT movement. She attended the 2010 MTV Video Music Awards accompanied by four gay and lesbian former members of the United States Armed Forces who had been unable to serve openly under the US military's "don't ask, don't tell" policy, which banned open homosexuality in the military. Gaga urged her fans via YouTube to contact their senators in an effort to overturn the policy. Gaga appeared at Europride, an international event dedicated to LGBT pride, in Rome in June 2011. She criticized the poor state of gay rights in many European countries and described gay people as "revolutionaries of love." Gaga was ordained as a minister by the Universal Life Church Monastery so that she could officiate the wedding of two female friends. In June 2016, during a vigil held in Los Angeles for victims of the attack at the gay nightclub Pulse in Orlando, Gaga read aloud the names of the 49 people killed in the attack, and gave a speech. Later that month, Gaga appeared in Human Rights Campaign's tribute video to the victims of the attack. She has opposed the presidency of Donald Trump and deplores his proposed military transgender ban.